Tigers Unleashed. It's been a long hard road, but we continue to push on! Tigers Unleashed the TSS Series: News from behind the scenes! Over the next few days something was bugging me about it, so as I had no spare cash at this point I asked my Mum to buy the actual CD for me as a slightly early Christmas present, and I'm so glad I did (sadly this situation at a later date was used against me when someone decided I'd pirated the game and contacted Scott with this information. Thankfully at that time, unknown to many, I was already good friends with Scott). As soon as it came I reinstalled and decided to contact Scott about the issues I had found and also my thoughts overall about the game. I could see by this point the immense potential this game had if it's problems could be fixed and features enhanced. Scotts reputation however made me feel I wouldn't get a response so when this lengthy yet very interesting reply came I was rather surprised. It quickly became apparent to me Scott really wanted and needed some committed people to help test the game and get involved in improving it and getting it to reach it's potential it also became apparent on how committed he was to the game. So from that moment onwards I haven't stopped helping Scott and the other long term team member Jeff in trying to get the game to reach it's amazing potential. It seemed all this time he was wanting people to get involved and help out, he wasn't some recluse who kept it all very secret. To show how much he had needed people to help test and give feedback was when after three months of testing he told me he had had more feedback from me in those three months than in all six years of previous development. Another major thing quickly became apparent aswell, it was going to be a long drawn out process and not one for the impatient. The game is so complex plus with just one of us doing the code (Scott) that even minor issues can take weeks to fix and may require whole sections of the code to be rewritten. 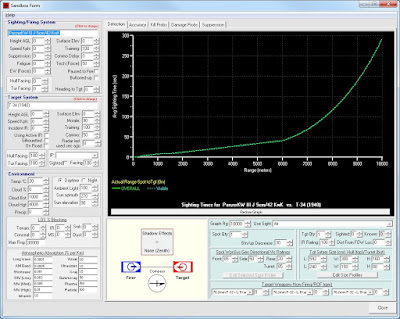 This can then have some knock effects which will need to be fixed as they become apparent in testing. To give you an idea of how complex the game is I once asked Scott if he could modify something regarding LOS (can't remember exactly). His reply was an explanation of how the game deals with sighting, it involved photons and god knows what else, so wasn't just a case of a quick number change here and there in the code. 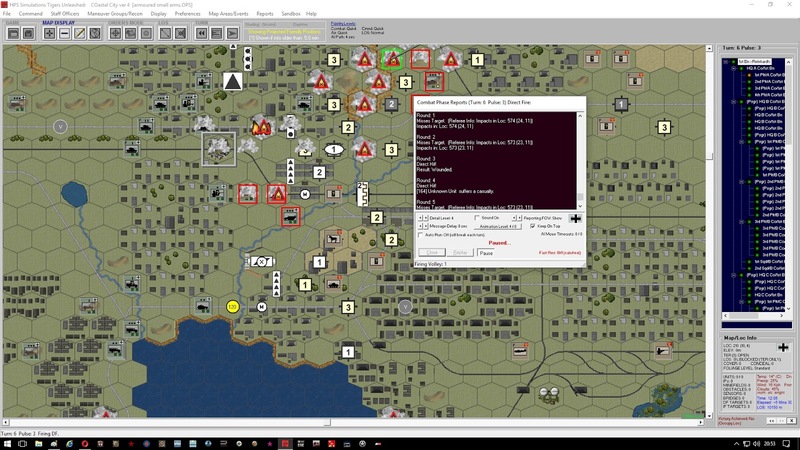 I suppose as POA was also made for the military then it had to be this complex to model new offensive and defensive technology. Due to the games complexity and the time it can take to fix things or add things any patches released have been very few and far between. Leaving a customer base extremely unhappy and convinced the game is dead and abandoned. 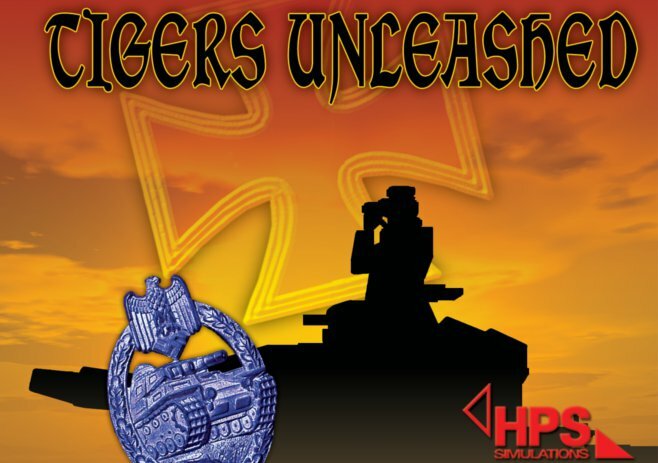 Tigers Unleashed is another POA2.5 Or future customers are put off buying it. Yet work hasn't stopped since the day of release. I doubt a day hasn't gone by where nothing was done. Apart from the testing I've created more or less a whole new set of unit symbols for more or less every vehicle and Infantry type in the data tables. I've also added loads of new sound effects. As far as testing goes I have over forty pages in Outlook containing all the emails I've had in reply to my own and I'd say I've sent Scott three or four times that many.I promise that we who work on it are also extremely frustrated about how much time it is all taking. I'll say here and now when at times it seemed we had taken one step forward and then, yet again, another two steps back I felt like throwing in the towel. However we have all become firm friends and we all still believe in the game and it's future potential is just to great to abandon and leave behind. So we continue to work on it, over the course of the few years I've been involved the odd person has come along to join us but soon left as the game does require alot of commitment and belief. One other drops in every now and again and that's Harry (Hello Harry). He really gets into the nitty gritty and will be very valuable in the later stages of testing and all the obvious things are working as they should be and I hope start getting close to it's full potential. Alot has been done and achieved over the last four years, most of it the player wont really notice but needed doing. Alot of code has been fully rewritten which will help with any future bugs etc by speeding up the fix process. The game also has some new features the player will notice and I'd say nearly all game features have been improved on to some degree since release. My latest test patch is playing better than ever when it comes to a game being derailed by a bug or crash. Infact those who haven't played the game since near the release will definitely notice the all round improvement to the game. Saying this we still have a long way to go. Currently there are two biggies that need to be done. The first is that the AI needs a total going over, both it's defensive and offensive capabilities need work. The second is that there are still some issues regarding actual combat which need ironing out so that the game plays out in a realistic manner. Then we have my own personal wants and requests. I feel the game needs some new ways of getting over information to the player say at the end of each turn I've done a couple but the stock scenarios do the game little justice and they need reworking. More aswell as better use of current features, for instance the combat report could and should be something that can immerse the player aswell as add tension etc to the game. SOPs based on distance to enemy be added which in turn when set with the current set of SOPs for the AI during scenario creation will help improve it's performance immensely. 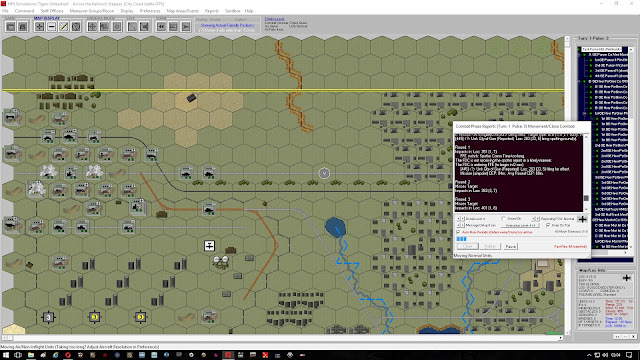 Scratch built, unique, non geomorphic maps created, some creating the actual terrain a historical battle was fought on. 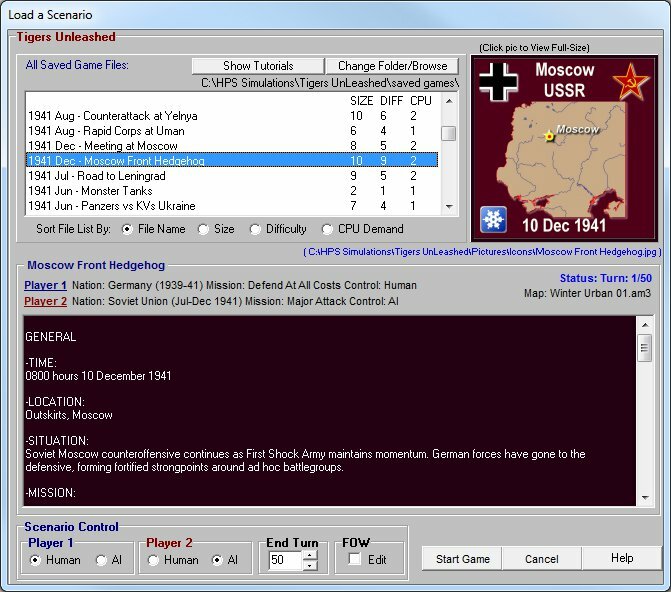 Make sure all weapons, ammo, vehicles and infantry types in the data tables are also in the games extensive TOEs the players can pick from when creating a new scenario. Last I suppose on the list is the campaign feature which isn't actually working so the award\medal system doesn't work. Again this is something that will get done as we'd love to make actual campaign disks once the game has reached it's potential and I guarantee when that happens it will sell and sell well. Looking back I've really enjoyed testing the game and have made a great friend in Scott. I also gained new skills making the new default unit set which I really enjoyed doing and I feel not only enhances the game visually but also helps the player with regard to knowing exactly what vehicle, AFV or infantry type it represents.The new sound effects also help with the immersion aspect. That's the additions I've personally have made to the game besides which it also sports an endless list of fixes and improvements, aswell as new features, some obvious and others not ,which again improve the game experience. So what is easily the most complex and deatiled tactical wargame ever developed for civilian use is improving at every step and the next patch is the one I think were players notice the game making good strides towards it's full potential. 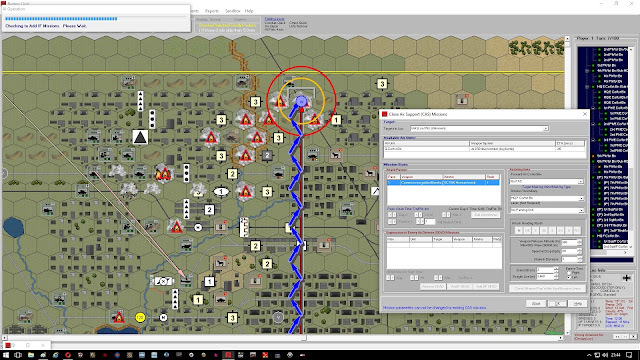 Which is a great thing as I reckon we wont see a tactical wargame of this complexity released to the public for a very long time, if ever. Note: I'll keep you updated on progress as much as possible, however until you hear work has stopped on TU (not happening), which I'd post here, we will be busy working away at the game. Currently we are probably at test patch 30+ by now. However we only want the next patch to be worth putting out to you all....so sometime next year..can't say exactly when. 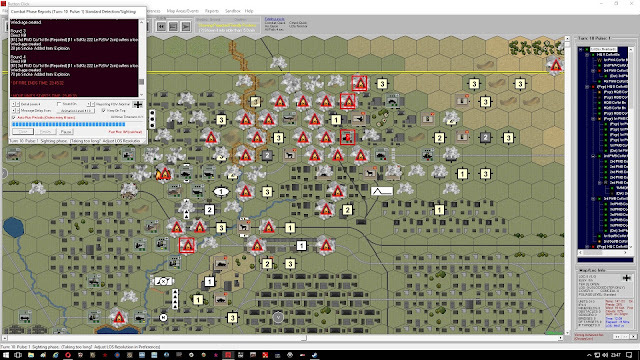 Please speak with Scott regarding the historical maps and scenarios. I created several dozen maps based on WW2 topos and in most cases matched with planned historical scenarios. Technical issues prevented their inclusion in TU at the time. Perhaps the program is now in the condition where it can actually run a scenario on a historical map. These maps represent several years and thousands of hours of work, and it would sure be nice to seem them actually used. I worked with Scott for almost 20 years on everything from Tigers on the Prowl to Tigers Unleashed, and confirm all you have written regarding both him and TU. Life circumstances preclude my continued involvement, but I continue to count Scott as a friend. As for the maps..wow they would be a GOD SEND!! Email me at j__rimmer@hotmail.com (two underscores) or contact Scott:) I've passed the message on!! Exciting! Hi nick! I am just curious if you have at all any of the extra scenarios still fotr tigers on the prowl and panthers in the shadows, that were bundled as campaigns. I had queried with hps but they no longer had any, losing them in a hard drive crash sadly.